Cody Wilson, of Defense Distributed, holds a 3D-printed gun at his Texas shop. A quick online search for “3D guns and Ruger” shows a 2016 YouTube video with an unnamed master gun technician demonstrating his 3D-printed Sturm Ruger 10/22 model rifle. It’s a tad scary for anyone who fears the widespread expansion of untraceable, hard-to-detect firearms. For gun enthusiasts, it’s just another cool gadget video. The host, billed as “Guy in a garage,” fires off 10 rounds at a target. Back at his bench, he shows viewers the rifle parts — including the receiver, heart of the weapon. You can see where this is going. 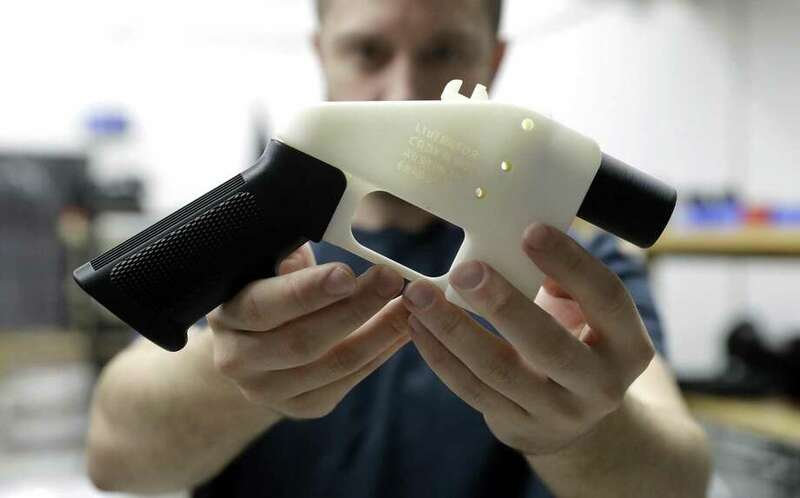 Now the 3D printing of firearms has exploded onto the national consciousness with a Texas case that threatens to unleash blueprints for AR-15’s onto the weboshere — where any of us, supposedly, can download them and turn out deadly weapons made of plastic. Maybe they’re merely an “overblown” worry that “does not present a new problem or likely threat to law enforcement.” That’s the view of Larry Keane, general counsel at the Newtown-based National Shooting Sports Foundation, whose blog posts — such as the one Wednesday about 3D printing — serve as a steady, calming, unshrill industry voice. And why isn’t the gun industry worried about losing business to home hacks? That matters in Connecticut, where we have Ruger in Fairfield, Charter Arms in Shelton, Colt in West Hartford, O.S. Mossberg in North Haven, the former Stag Arms in New Britain and a lot of smaller players, not to mention history in Bridgeport and New Haven; and Keane’s NSSF, which represents the whole industry. Many elected officials, chiefly Democrats, are calling for outright bans of any “ghost guns,” those without a serial number from a federally licensed manufacturer. That might make sense except that, as everyone agrees, 3D printing is here to stay and regulating it will become harder and harder. It was, as expected, the lawless and irresponsible actions of the current occupant of the Oval Office that set all this in motion. Defense Distributed lost its attempt in court to snub U.S. State Department rules against releasing the plans. His appeal went all the way the the Supreme Court, which declined to hear his appeal. Federal airport screeners at TSA say they can detect the 3d guns now out there but of course we don’t know how reliably, and checks at stadiums are far looser. In Shelton, Nick Ecker doesn’t believe the hype about 3D guns. He’s the owner of Charter Arms, a maker of several models of revolvers, with about 25 employees — down from a peak of 45. They’re plastic models, he said — not the real deal, and no one can just go out and make a working gun purely using a home machine. Additive manufacturing, also known as 3D printing, has developed steadily over the last 15 years. Basically, it uses programmed robot arms to build complex parts speck by speck, using either powdered metal or plastic polymers. In East Hartford, Pratt & Whitney uses it to make critical jet engine parts on its latest geared turbofan engines. Keane isn’t wrong; the threat is not significant in 2018. And Eckert is not wrong; there are many bigger issues in the firearms safety realm. And so, as we breathe easier even knowing the blueprints will, sooner or later, bleed into the public domain, there’s no reason for states like Connecticut not to ban plastic, homemade firearms outright. It won’t save lives today, but it might someday. And anyway, the gun industry will thank us for it.